So tell us a bit more about this amazing venue you were performing in? I performed at Nordic Northwest – a brand new and very impressive facility built by the Scandinavian Heritage Foundation, which is supported by the many people in Oregon who have roots in Denmark, Sweden, Norway, Iceland or Finland. And what did you perform there? I gave two performances of my solo, two act comedy Rainer Hersch’s Victor Borge, which is a narrated story about the legendary Danish/American pianist and comedian – mostly funny but sometimes very poignant as well. I am the narrator and play both Borge and myself. You can read more about the great Victor Borge here. What was the reaction like in Portland? Very good indeed. When they see the title of this show, people aren’t always sure what to expect – often they think it is going to be some guy just doing Borge’s act. But, ultimately, this show explores my relationship to Borge. It is funny – stand-up funny – all the way through but it is also very personal. As well as Borge, there is a lot of me in it – and I seem to have got away with it! The Americans have a fond affection for Borge. He arrived there during WW2, worked with the likes of Bing Crosby and Franck Sinatra and had his own hugely successful TV and Radio shows. I have done my show hundreds of times now since I wrote it for Edinburgh in 2004 and, I am happy to say, the reaction is always the same. So what else did you get up to? I cycled around a lot on a hired bicycle in between the rain. It rains a hell of a lot in Portland. I think the sun came out only once. And, when it does, people walk along the Willamette river which is beautiful – near the cannabis factory! There is also the only inner city cable car I have ever been on. It runs from the hospital to the hospital car park because there wasn’t enough space to build both side by side. Bit of a bummer if you happen to be visiting as a result of a skiing accident but the view from the top is bloody marvellous. And did you learn anything else about the States? 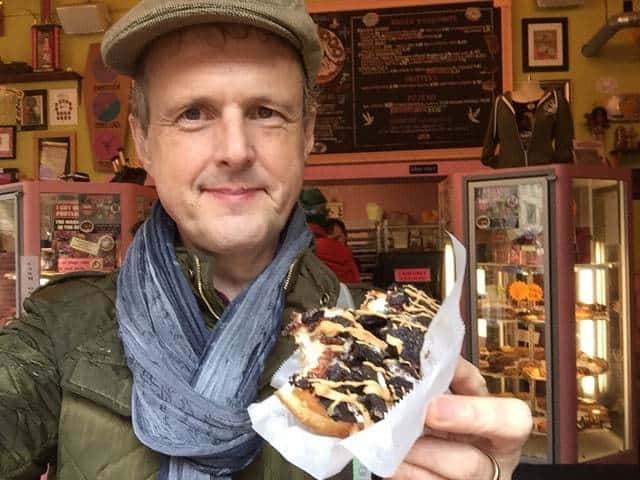 I visited Voodoo Doughnut, a much-loved stop on the Portland tourist trail, and munched my way through enough calories to feed a village. And, of course, I was there over Halloween, which the Americans do with flare and passion. Everybody is in fancy dress, from bank clerks to bar staff. I thought of going as Victor Borge but thought maybe it wouldn’t have been quite his style. Don’t miss your chance to catch The Rainer Hersch Orkestra and The New Year’s Eve Bash at London’s Cadogan Hall on 31 December – the perfect New Year’s Eve event for all the family. As a former singer who especially loved singing big choral pieces, I so enjoyed watching you conduct the Pachelbel. What an accomplishment. I have passed that idea to a conductor friend. What a fabulous idea for a fund raiser. So much work. But so appreciated by those of us in the music field. I will see about buying some of your CDs, DVDs, allbums anything. You definitely need to be encouraged and enjoyed and supported. I have discovered you late in my life and hope you still are bringing laughter and an appreciation of music to so many and hope it brings you happiness also. It seems to, as I love your twinkle. Thank you for these kind words. I am really happy if what I do is so much appreciated.